First of all, know that as far as I can tell there's no reason to BUY image storage. 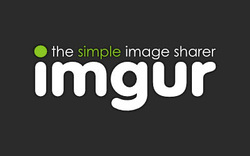 If you run out some where, you can always use Imgur, since it is UNLIMITED. That doesn't narrow it down much though... I mean, there's a lot of free hosts out there. One must choose wisely. I don't at all recommend flickr or imagr. Both are just un-user-friendly and weird. Click the text of the review to visit the site (it's blue if it's linked). You can see all the images you've uploaded at once down below if you scroll down the page. You can add titles to them here as well. You can also click the "library" button on the top nav bar anytime to view all your images and albums. 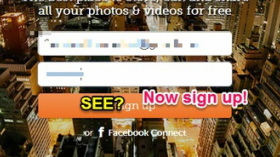 First of all, head to photobucket (click the text above and it will open in a new window). Then you'll have to fill in a couple of other things like your birth date and the like (I am sure you can handle that yourself). Then you're registered! Now, the actual uploading part. Follow the text on the images! An album is just that... an album, you name it and add photos to it and can scroll through the photos in an album all together. A story is, well, using photos and captions in the right order to create a story, like an online story board. Stories are made from albums so you have to have all your photos in an album and then go somewhere else to make the story. 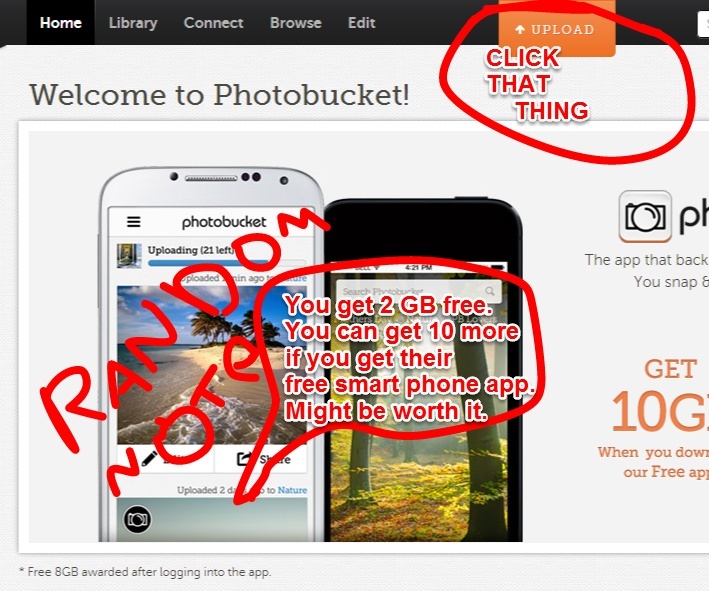 Click the drop down on the word "your bucket"
Click create and the photos you upload will go in there. Now do you get the codes you ask? You can view all your images from your library anytime (it's on top of the nav bar). People can comment on your photos and you can add titles and descriptions. imgur is a very simple option. It doesn't have as much complication as PhotoBucket, and it doesn't exactly say how much space it has, but if I recall it's more than the small 2 GB of PhotoBucket. One downside to imgur is it's web designer: whoever got hired to design the color scheme for the site shose black, gray, and green, which makes one feel as though one is looking at a terminal computer from the early 90s. But regardless, it's very simple and offers albums for your photos so I'll give you a little review. One really cool thing that Imgur lets you upload and image that is not on your computer. I'll show you later, but that's a cool feature- you don't have to save every image you want to share to your computer this way. Anyway, as usual, a short and long version of the tutorial is on the way! You can click the word "albums" in the top right as well to view all your albums. Click an album to view the photos in it. Direct link is for HTML codes, CSS, Java, etc, any kind of code you're writing. You can use it in place of the Link as well, I think. Markdown Link is what you use on the social media network, reddit. Us graphics people aren't redditing our work so you can ignore that. And that's it, you're done! If you get stuck click here to visit imgur's FAQ page, it's very helpful! (it opens in a new window). tinypic doesn't require an account, and in fact doesn't even give one the option, and also doesn't appear to have a storage limit, although after five years or so it gets deleted eventually. 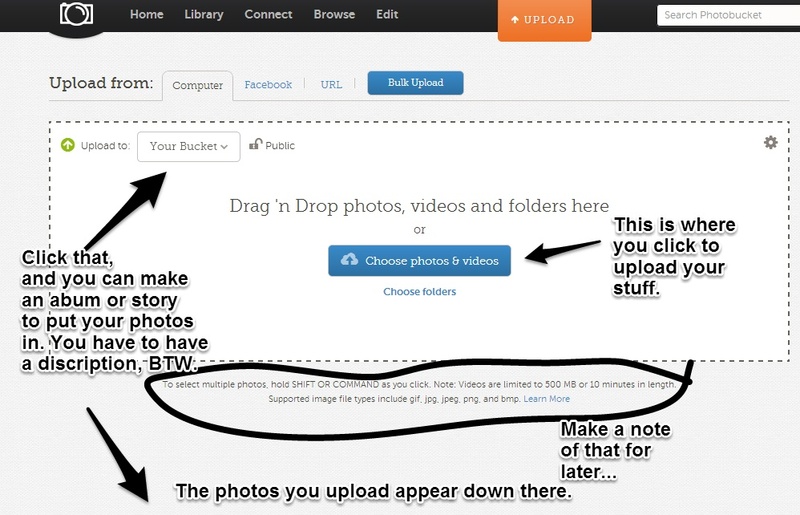 tinypic is very easy to use, but you can't have albums or go back later to get things, rather you must upload them again. you'll have to enter a code in a pop up window to prve you're human, or you may have to watch 5 seconds of a video and then enter the code. There you have it! My top two are definitely Imgur, than tinypic, with photobucket last, but hope it helps!